Happy National Boysenberry Day, everyone! Yes, today is the first-ever National Boysenberry Day, as declared by... whoever is in charge of national days. And also Knott's Berry Farm. 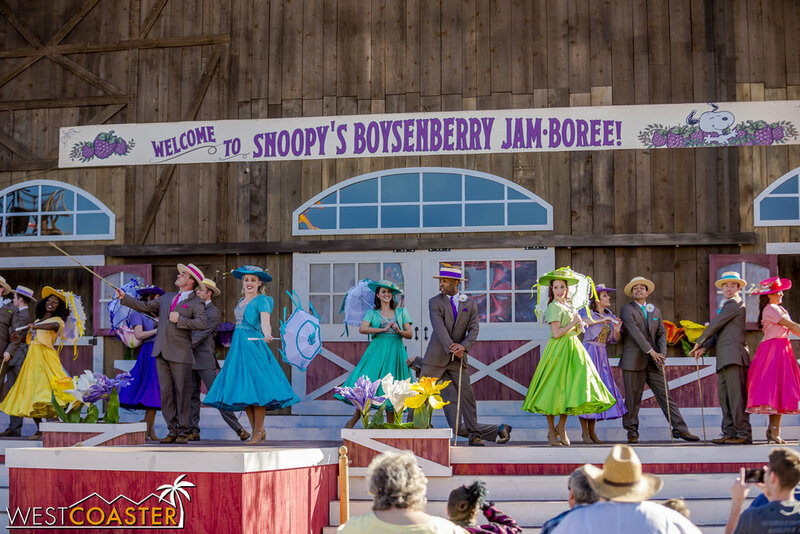 To celebrate, we're going to take a look at this year's iteration of Knott's Boysenberry Festival! 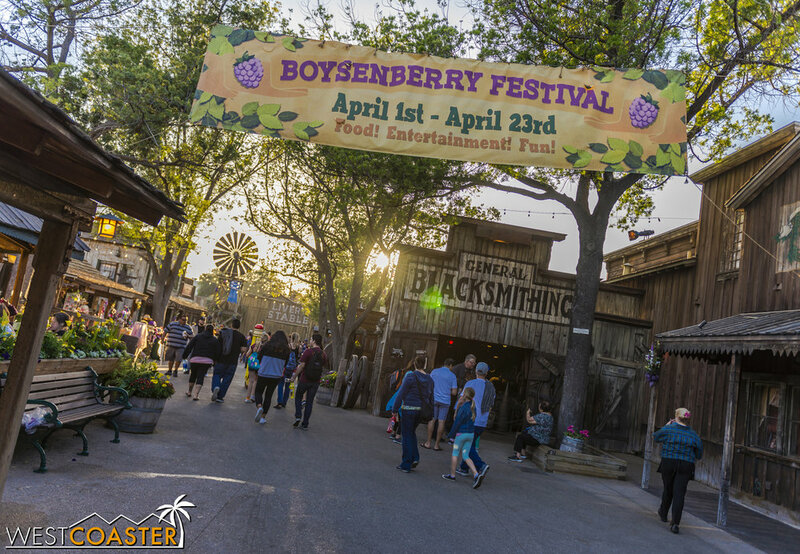 Now in its third year and running through Sunday, April 23, the Boysenberry Festival has become Knott's spring season event. 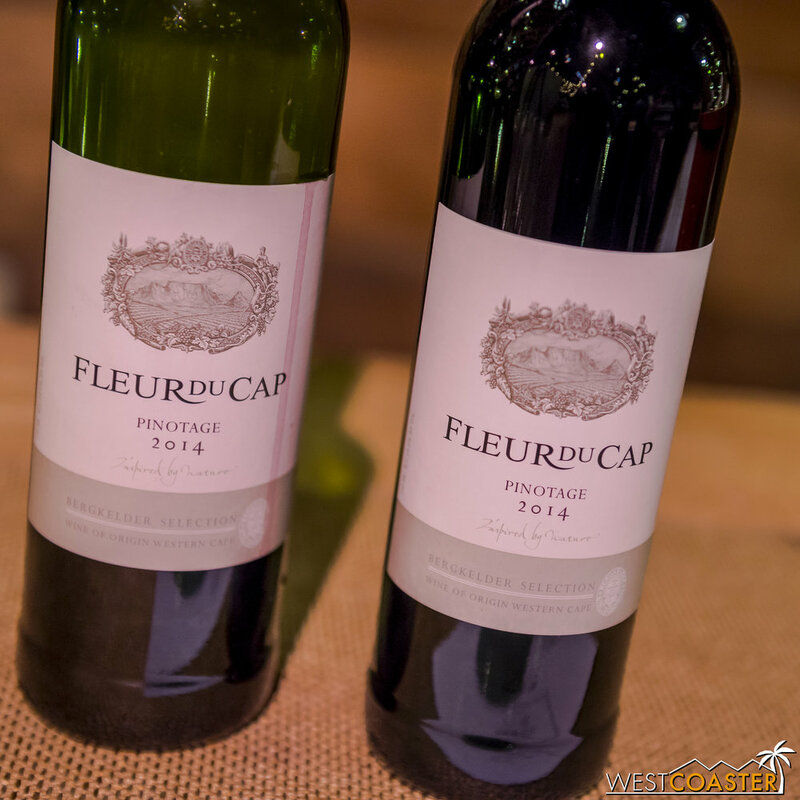 With a charming marketplace, fun entertainment, and of course, delicious food offerings, this complement to Disney California Adventure's Food and Wine Festival has become a popular even in its own right! Lets take a look at what's to check out this year. First, though, a few housekeeping things. 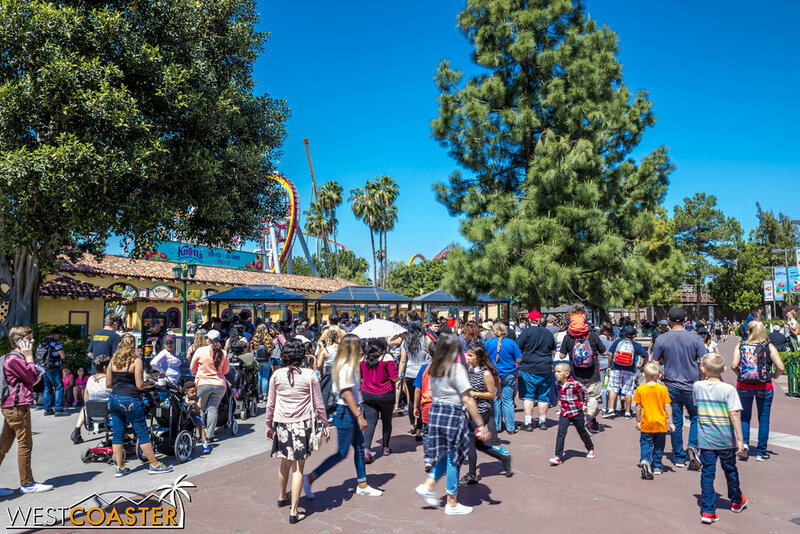 Knott's has finally joined the rest of the Southern California theme park crowd in installing metal detectors at its entrances. Sadly, the reality of these days means that even America's First Theme Park now must screen guests for weapons. This will increase waits getting into the park (something to keep in mind come Haunt time, when the park is at its busiest), but the process seems to be fairly efficient (based on Saturday's busy cycling). 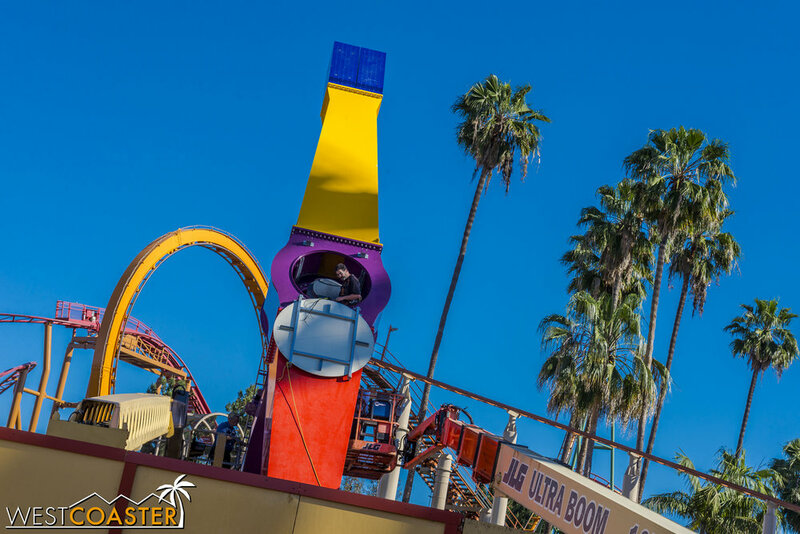 Also, in Fiesta Village, work is ongoing for the installation of the new Sol Spin ride on the site of the grave of Windseeker. And in the Boardwalk area, the new VR Showdown in Ghost Town upcharge attraction has opened. There are three banks of metal detectors on each side of the entrance plaza, each with two metal detectors, for a total of twelve detectors--each with its own bag station (I'm looking at you, Disney)--to screen guests. And they're under permanent structures! If Knott's could do this in a few weeks, there's no reason Disney couldn't. Although the line was somewhat lengthy, the process moved relatively quickly. Also helpful was signage indicating what to remove and keep before passing through the metal detector. In Fiesta Village, workers were actually working on the Sol Spin attraction on a Saturday. This ride is scheduled to open... soon? Over in the Boardwalk arcade area, under Voyage to the Iron Reef, the new VR upcharge has opened. It basically uses an Oculus Rift type of set-up. It also has plenty of Kingdom of the Dinosaur references, specifically to Professor Welles. The cost is $6 for a three minute experience. It's actually pretty fun--nothing incredible, but definitely exciting, especially when you realize enemies can sneak up behind you. But we're here to talk about the Boysenberry Festival, so lets get on it. Also, check out that awesome fan-made Catawampus button by general Knott's superfan, Hendel Thistletop! Oh yeah! And Boomerang is closing forever this month. The last day of operation is Sunday, April 23--same as the final day of the Boysenberry Festival. Get your final rides in if you're a concussion enthusiast. It won't be missed. 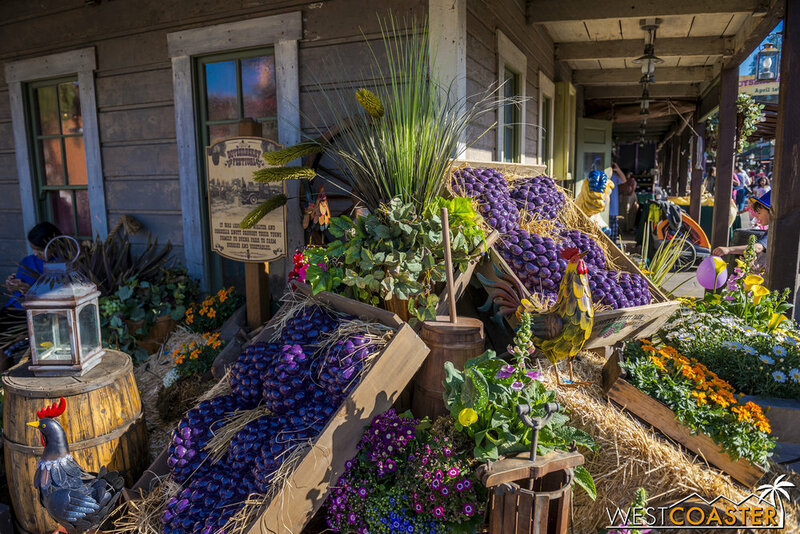 The Boysenberry Festival brings charming berry-themed decorations throughout Ghost Town and even to other areas of the park. 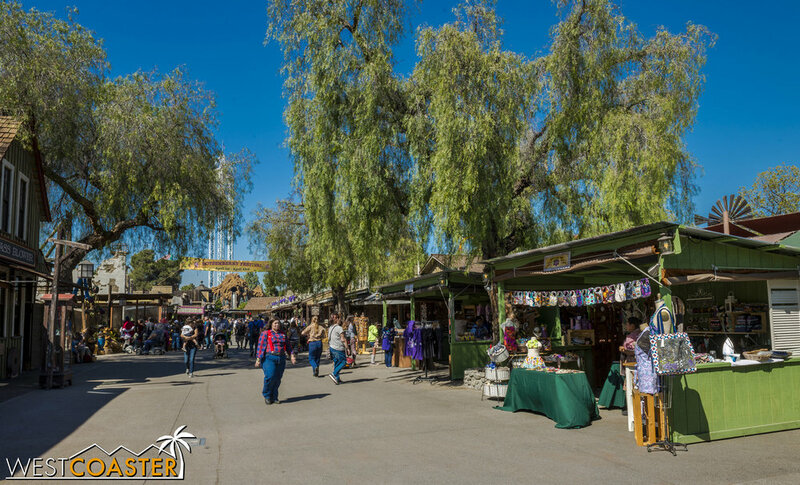 Similar to some of Knott's other seasonal overlays, like Knott's Merry Farm, there are various vendor stalls set up throughout Ghost Town to sell arts and crafts and home-made items. 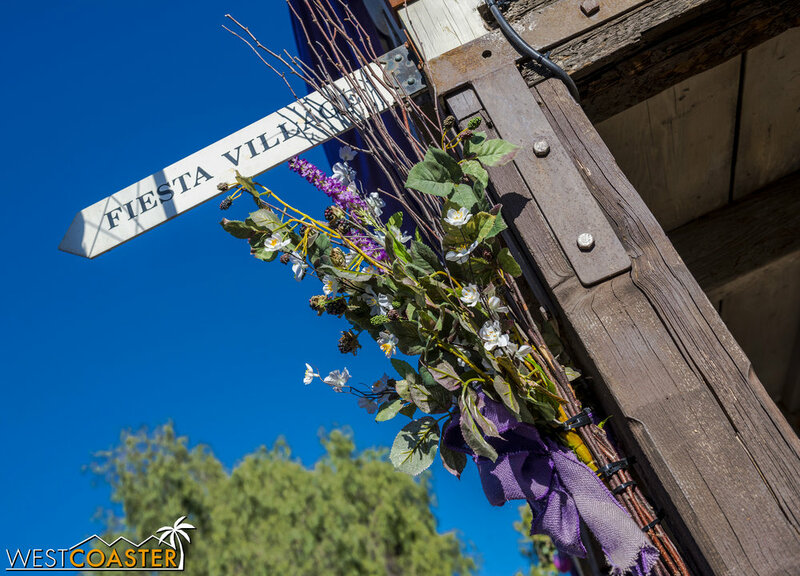 The theming is absolutely lovely--hand painted signage and flowery arrangements bring for the new life of springtime, and under the rustic environment of Ghost Town, they really make for a nostalgic environment! Wandering through Ghost Town. No fog or snoap, but plenty of flowers and berries! There's a great photo op area in the front. Nicely put together by the Knott's paint and props team! Sheriff is still on vacation, but he'll be back in the summer! One of the many places to get food in Ghost Town. The park is bustling with springtime energy. Plenty of vendors on hand to sell various items too. More can be found on the street to Calico. Lots of artwork and crafts. Calico Park is looking great in the spring! Bouquets and flower elements really add some pizazz to Ghost Town. These little recurring displays look super cute. Really ups the ambiance in the park! Shoutout to the painters who helped with this, including some who are also Haunt monsters! If you need a bear cut out of wood, Knott's has the thing for you! Here are some more of the items one can purchase at the Boysenberry Festival. The jerky is pretty tasty, and kind of tender too! Need coffee without any need for sweetener? Plenty of official merchandise for the event too. The decorations aren't limited to Ghost Town either. The fountain at Charleston Square has been transformed into a giant flower bed. And at night, the boysenberries light up too. 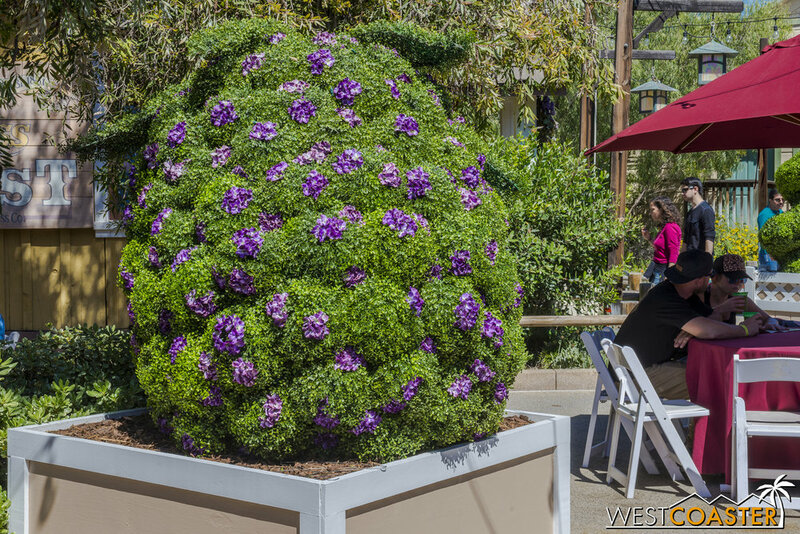 Similar to Disney's Food and Wine Festival, the feature attraction of the Boysenberry Festival are the food and drink options. 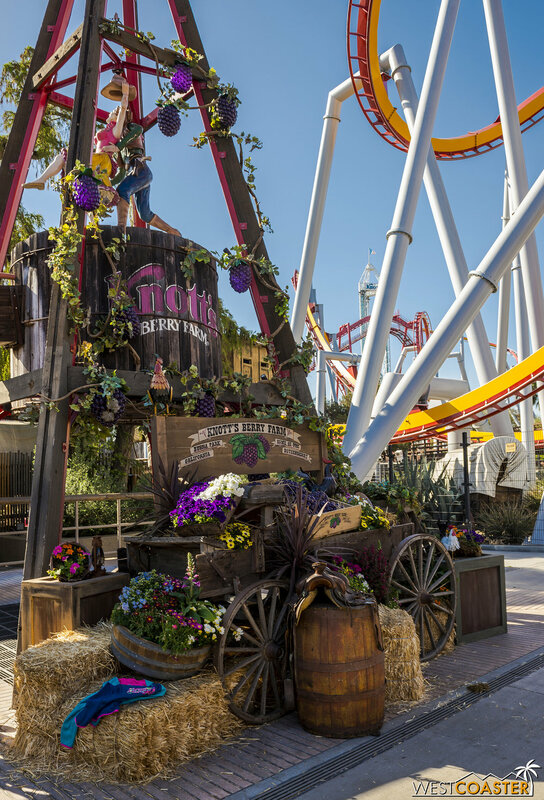 Everything carries a Boysenberry theme, of course, so folks who don't enjoy the fruit that made Knott's famous probably won't care for this event. Then again, those folks are also probably monsters. Anyhoo, for those of us who enjoy theme park adulting, there is a nice wine and beer tasting area inside and just outside the Wilderness Dance Hall. 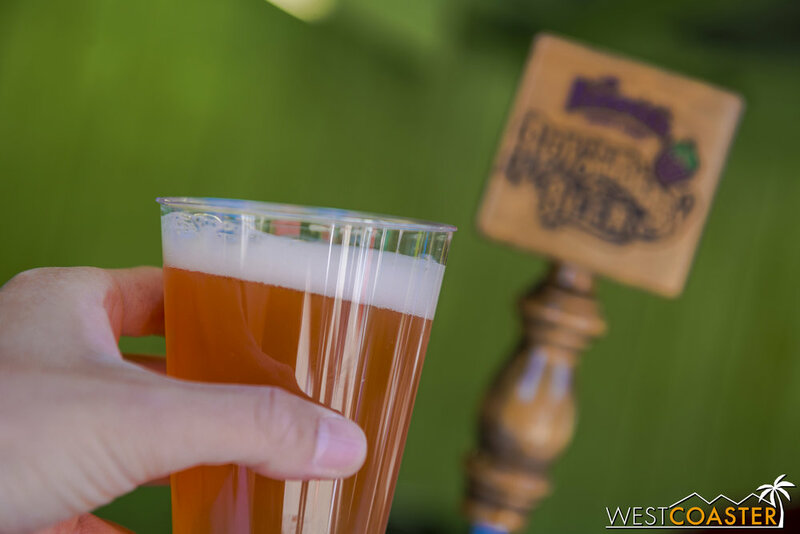 Guests can purchase a $25 tasting card that provides (6) samples from the (9) wine booths set up inside and the boysenberry beer and cider stand outside. The tasting card also comes with a complementary fruit, cracker, and cheese tray, to pair with the booze. There's a nice setup inside the Wilderness Dance Hall for boozing. Nice photo op and display on the stage. Among many others, the Midsummer Scream crew was on hand to check out all the wine goodies. And there were plenty of wineries and distributors to check out! Here are some of the booths I looked at. Each booth offered three bottles to try. This cab was pretty tasty. Definitely a bolder cab. Another favorite came from here. A tasty and full bodied red. 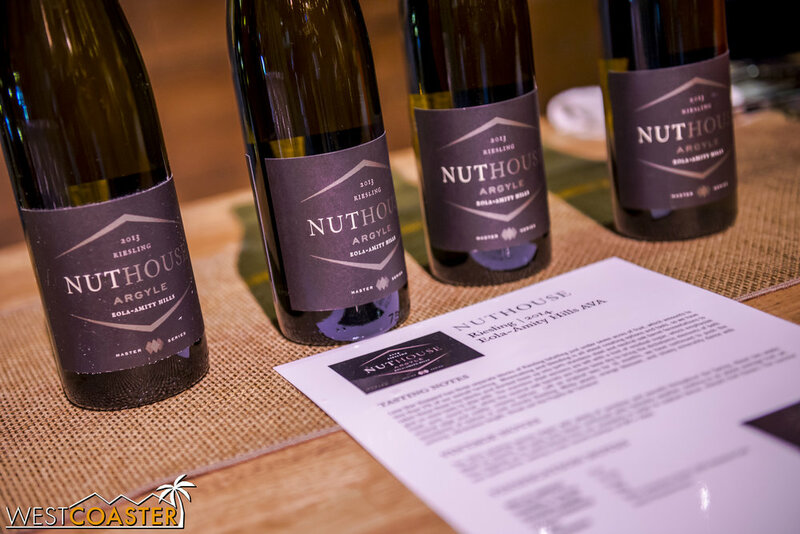 With summer approaching, Rieslings seem pretty nice. A can't-miss is this stop. Boysenberry. Wine. And now you understand why it was one of the more popular booths of the day. This is also a dangerous wine--it didn't really taste anything like wine at all! Most of the booths were manned by Knott's employees, but Flora Springs actually had someone from the winery who could speak intelligently about the wines and grapes. Complementary tasting tray. Overall, the wine here is an enjoyable, generally good selection. Nothing amazing, but good quality for the general populace, with enough quality that snobs should also enjoy things. There's a sitting area outside for those who prefer the sun. This is where guests can try samples of or purchase full size cups of boysenberry beer or boysenberry cider. You can also get half and half. They're all pretty tasty. Very fruity, as would be expected. Some adorable topiaries help set the theming. I mean, c'mon... Snoopy!! As Theme Park Adventure's Johanna can attest to, it was a great place to enjoy the booze! 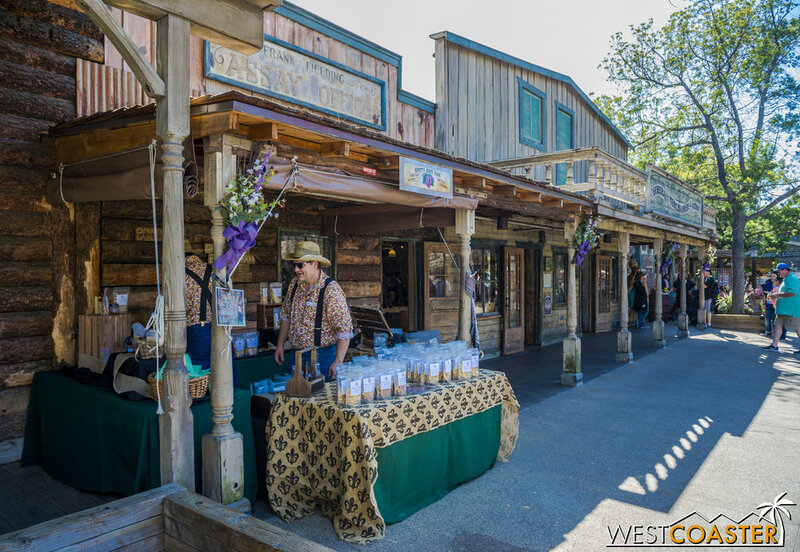 There is also a nearly overwhelming selection of boysenberry flavored food items both sweet and savory all around Ghost Town. 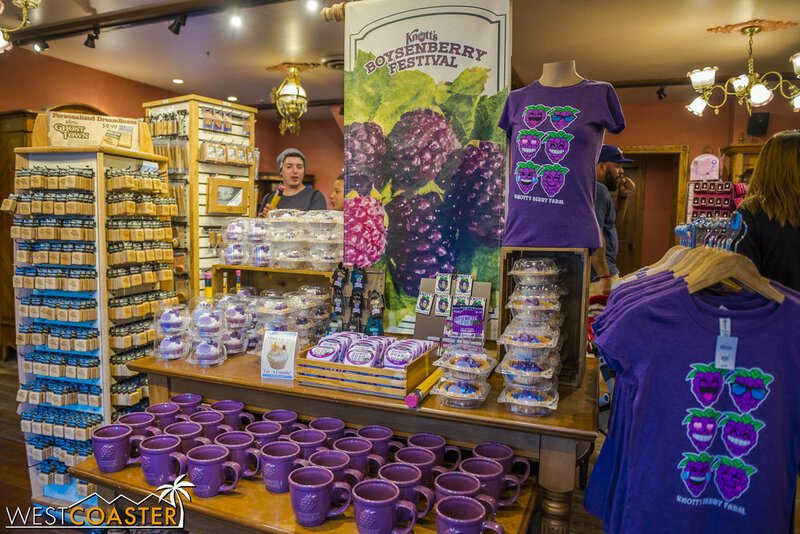 Those who want a sampling of featured items can purchase a boysenberry food tasting card (also $25) from multiple locations throughout Ghost Town and try tapas sized offerings of (6) tasty treats. In addition, dining locations throughout the area have special seasonal food items available for order. The best part is that season passholders who don't quite make it to each tasting card station can save their cards and us the remainder on a future visit within the Boysenberry Festival run. The same appears to apply for the wine tasting card too, which has no date stamp on it. The Boysenberry Panna Cotta is a sweet dairy treat. Very, very sweet. You can't go wrong with Boysenberry BBQ Meatballs. They're absolutely delicious, and the only shame is that they only come three to a skewer. Boysenberry Flautas are not part of the tasting card. Instead, they can be found at Ghost Town Grub, along with the Fun Bun and Fun Stick. Think of these as fruit filling taquitos. The Boysenberry Ravioli was interesting. I liked it but found the flavor combinations to be a little unexpected, which means this might not be good for everyone. The boysenberry pasta mixed with ricotta cheese had a nice tangy flavor, and the cream sauce and diced tomato topping provided added nice texture. Oddly enough, only two are provided but served on a full sized plate. The Fun Stick--a deep fried cheesecake on a stick with boysenberry jam and powdered sugar--is instant, delicious diabetes. 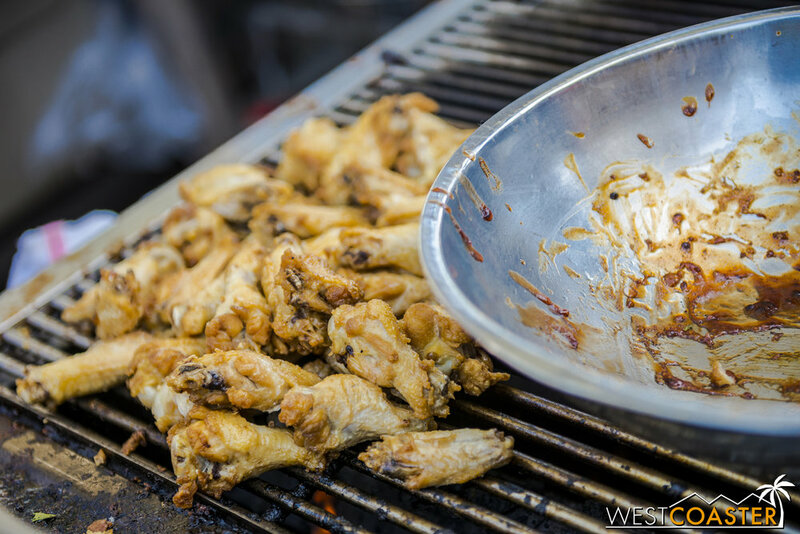 The Tasting Card also offers chicken wings tossed in boysenberry BBQ sauce. A lot of people questioned the Nutella / boysenberry combo of the Boysenberry Fry Bread, but they work very well. Add to that the cinnamon and sugar combination on toasted dough evoking a bit of a churro crisp, and you have a great dessert! The last tasting card item and new for this year... Boysenberry Pizza. With goat cheese, arugula, and bits of sausage, the flavor was great. I just wish it was served hot rather than lukewarm when I got it. Guests can get the Boysenberry Gator Bites over at the Fry Stand near the front of Ghost Town. It's pretty tasty, if you are brave enough to try it. Truthfully, it tastes like chicken but with a fishy feel to it. That might put some people off, but I enjoyed it. Maybe the relatively healthiest offering of the Boysenberry Festival is this dish: Boysenberry Short Ribs over Ric. The ribs were super tender, and you can't go wrong with all that boysenberry BBQ sauce! Shaun knows. This event is all about good eats. 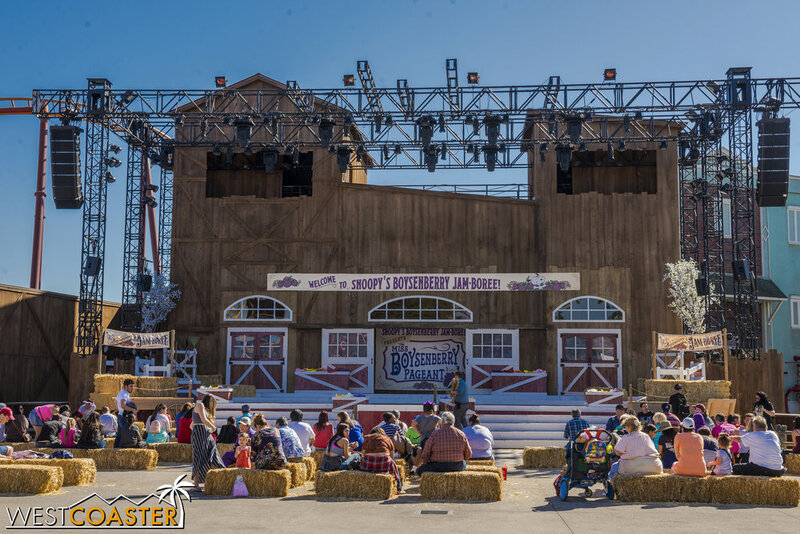 As with every Knott's seasonal event except for Haunt these days, there are a TON of shows to check out during the Boysenberry Festival. They're listed on the special Boysenberry Festival guide. 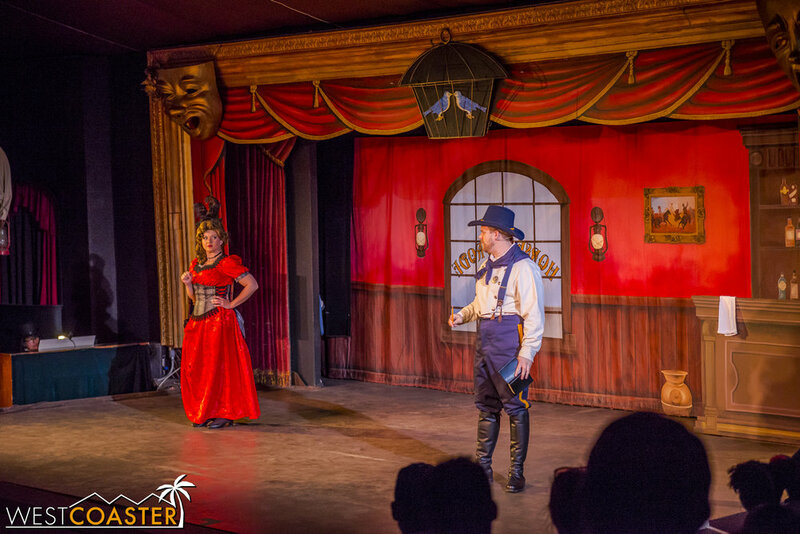 Some, like the Calico Saloon Show and Mystery Lodge, are recurring shows that happen throughout the year. Others, like Snoopy's Boysenberry Jamboree and History of the Boysenberry, have been created just for this event. Lets take a look at some of the offerings! A list of the entertainment for this year's Boysenberry Festival--some regular, and some special to the season! This short video can be viewed at the Calico Town Hall. Just several minutes long, it gives guests a brief history of the boysenberry, from its invention and abandonment by Rudolph Boysen to its cultivation and proliferation by Walter Knott. It's the berry that put Knott's on the map, so obviously, it holds a special place in park lore. 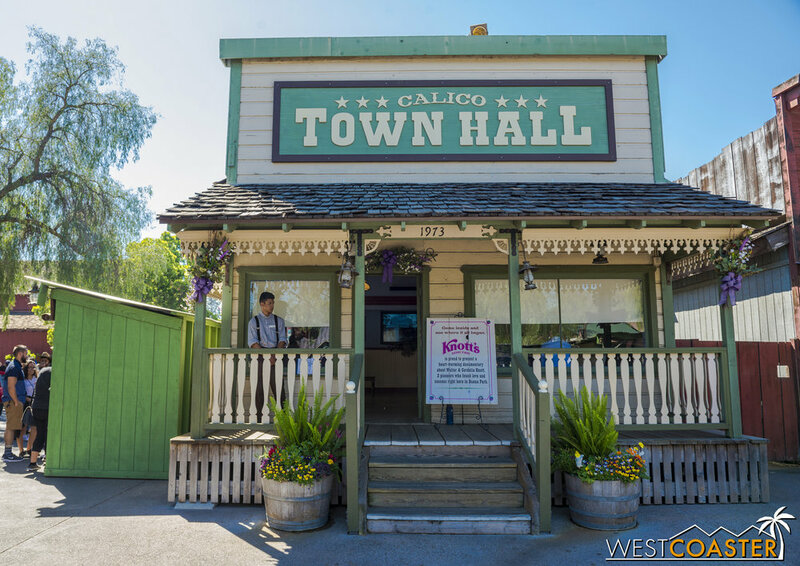 The History of the Boysenberry Presentation plays all day at the Calico Town Hall. The video plays on a loop, so even if you enter midway through, you can just stick around until the next playing gets back to where you came in. The video is very well put together. The end, especially, has all the feels. 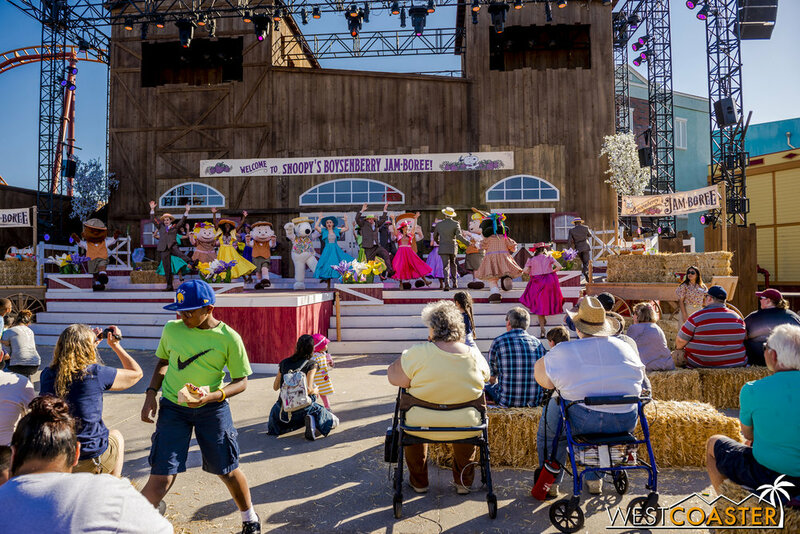 Throughout the day, guests can engage in dance, song, and eating contests in Calico Park. 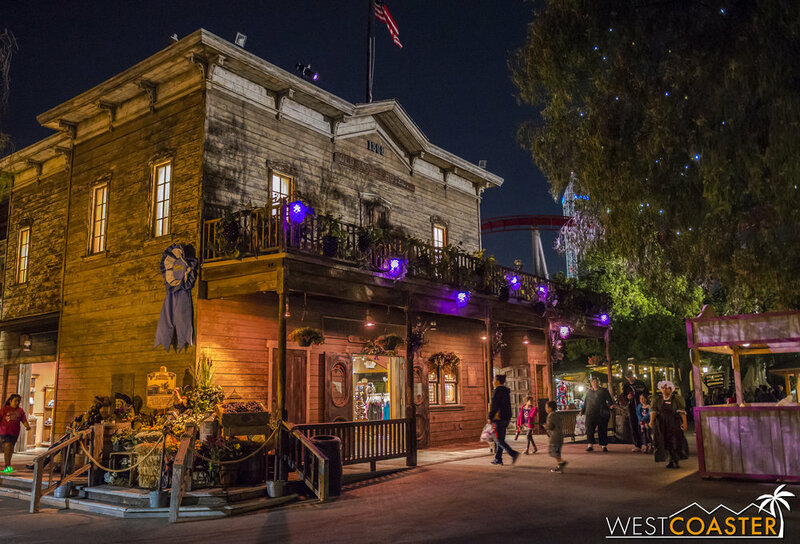 With performances and events running about hourly, this area provides a festive, town gathering atmosphere for Ghost Town. Calico Park isn't home to any specific show. It's more about general festivities. Here, the folks are prepping for an eating contest. The emcee, Phineas B. Berry, between acts. Line dancing in the evening. 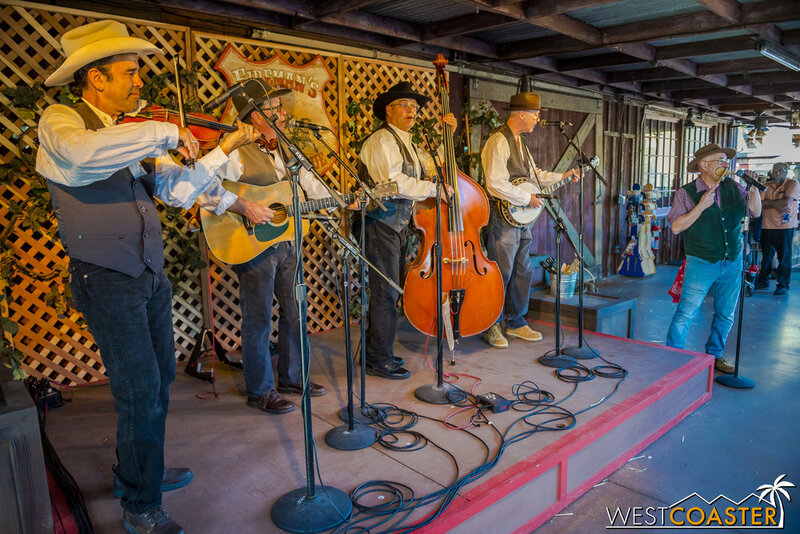 Similar to what happens at Ghost Town Alive!, Calico Park is a beacon of activity and energy. 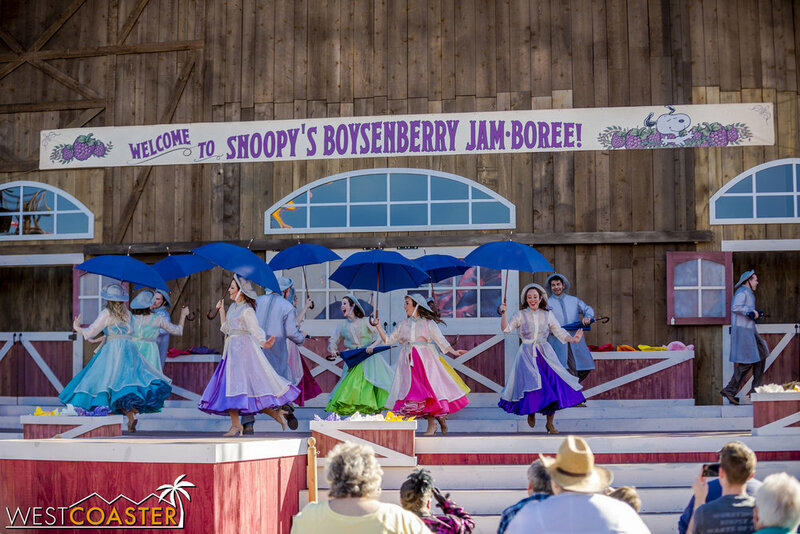 The marquee show for the Boysenberry Festival is Snoopy's Boysenberry Jamboree, which follows the Peanuts characters as they get ready and go through the festivities of the town's annual springtime celebration. 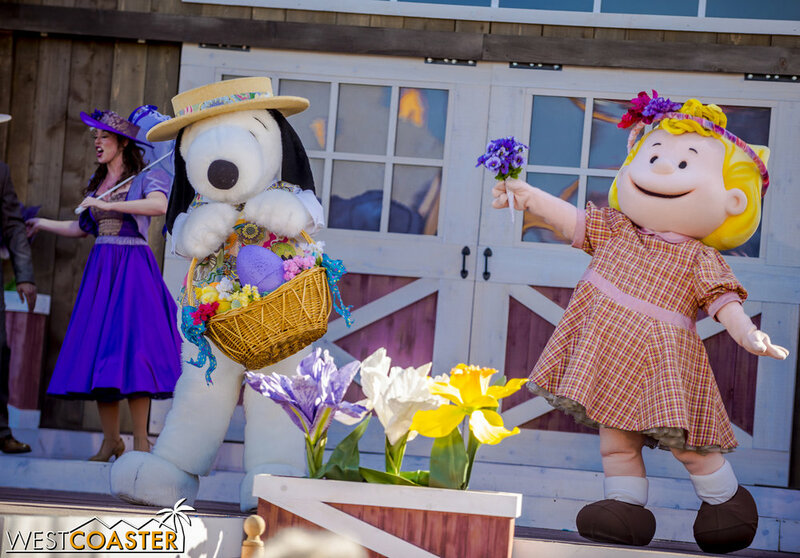 Located at the main stage at Calico Square, this show sees Charlie Brown, Linus, Lucy, Snoopy, and friends and a host of dancers and singers put on an adorable and wonderful performance to jazz up the season. People of Calico! ARE YOU READY FOR A JAMBOREE?????!!!! So this show is not quite The Hanging, but it is quite enjoyable. Things start out with a big dance number. I wonder where the boysenberries have gone... SNOOPY!!! Then, it's time to start the beauty pageant to crown this year's Miss Boysenberry. There are plenty of candidates to choose from. All lovely ladies with interesting and typically agrarian names. Miss Fruit and Vegetable? That's not a last name! Pick one! Miss Blossom and Bloom shows off her flower tossing skills. Linus grooves with the beat. And the last contestant (and probably most adorable)... SNOOPY!! Too bad he's not eligible. It's April and springtime, so you know what that means. You have to worry about April Showers. Ignore the perfect weather all around. It's raining on stage, dagnabbit! The Peanuts pals apparently aren't in the rain. 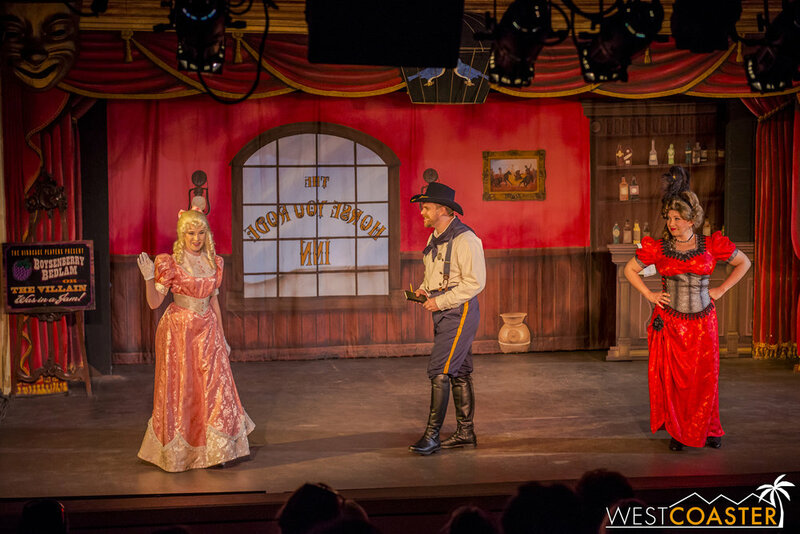 Knott's regulars may notice actors from previous Knott's shows. It's always cool to see familiar faces in different entertainment roles around the park. After the rainy dance number, it's time to wind down toward the finale. Snoopy plays nice and gives Sally a bouquet. It's great fun and happy spirits. The performers even encourage the crowd to participate. And to cap things off... CONFETTI!! Over at the Bird Cage Theatre, old fashioned vaudeville style storytelling comes to life in an intimate setting as a four-piece company tells the story of a sheriff investigating the mysterious death of the local boysenberry farmer, and a devious villain who aims to make a new empire out of the boysenberry. Along the way are twists and turns and laughs and romance. With heavy audience participation and actors who ham it up to the energy, this is a fantastically entertaining stage show that's fun for everyone! One of Knott's longest running shows returns with a new episode featuring the boysenberry in a prime role. Beforehand, two of the performers can be seen out front, hawking the next show. We meet our protagonist, the Sheriff investigating a case. Our female foil quickly follows. But in comes our damsel in distress, Miss Sweet, daughter of the mysteriously murdered boysenberry farmer whose death the Sheriff is investigating. Our lawman is quite immediately smitten. Enter our villain, secretly working with our foil to claim the treasure that is the boysenberry and all the future riches that will come with making it a wildly successful fruit. The villain is a scoundrel, so naturally, he kidnaps Miss Sweet. But the Sheriff is here to save the day. With some help from our foil, who decides to #FightThePatriarchy. The show climaxes with a daring chase. Does the Sheriff win and apprehend our villain? Watch the show to find out! 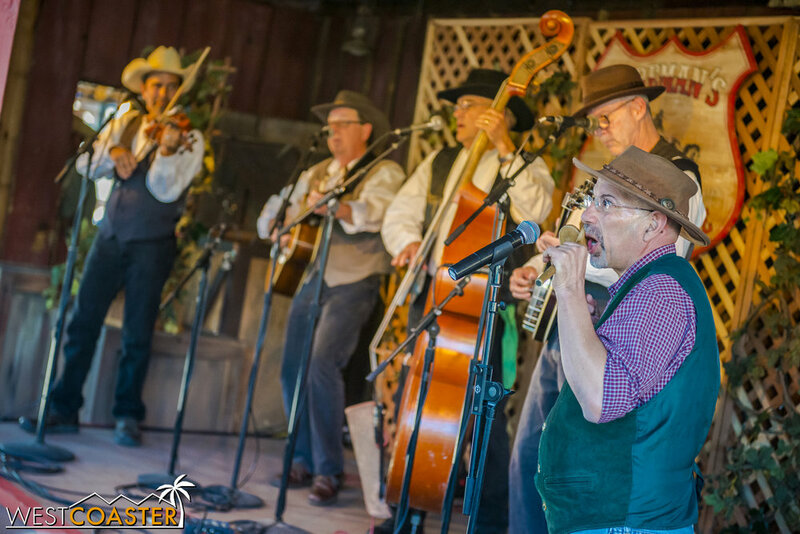 Over behind the Fireman's BBQ stand, a five-piece country and bluegrass band entertains audiences with energetic and slapstick songs. This musical bunch puts on a jamming and silly act. Situated next to the Fireman's Brigage Barbecue, this is very much a meal and a show. Care to play the spoon? The Ghost Town Miners had the crowd entertained all afternoon. 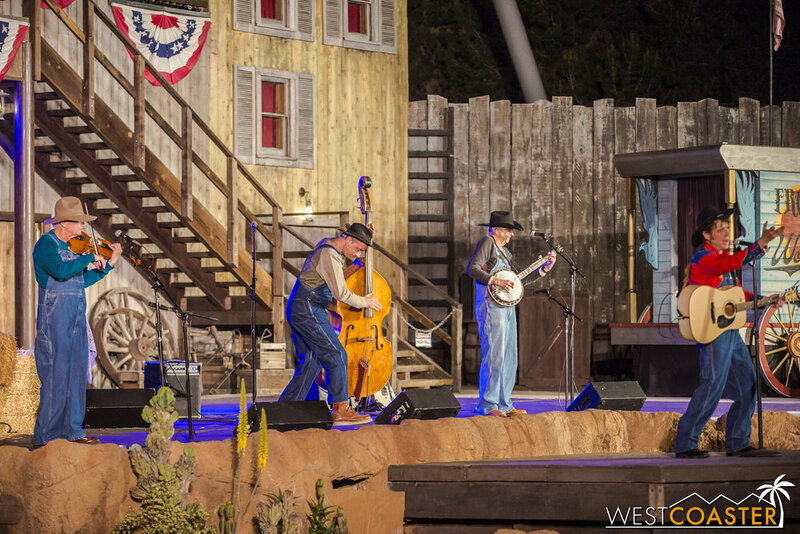 The Knott's favorite with a large fan following makes its outdoor debut with evening performances at the Wagon Camp, regularly home to the Frontier Feats of Wonder Stunt Show. 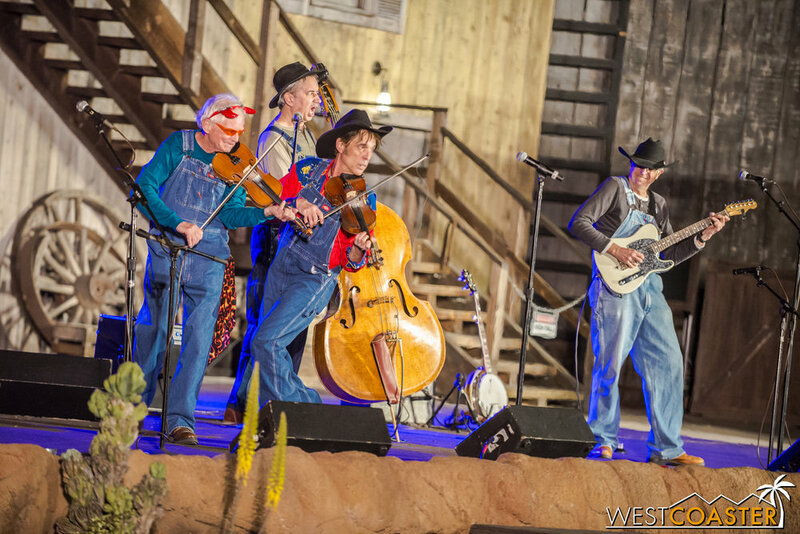 The former longtime Disneyland performers have found a great home at Knott's, with their high strung (get it) and hilarious act attracting plenty of laughs, cheers, and repeated viewings. Despite the larger capacity of their new venue, they still pulled in crowds on Saturday. Could this become a permanent move? It's Krazy Kirk and the Hillbillies! 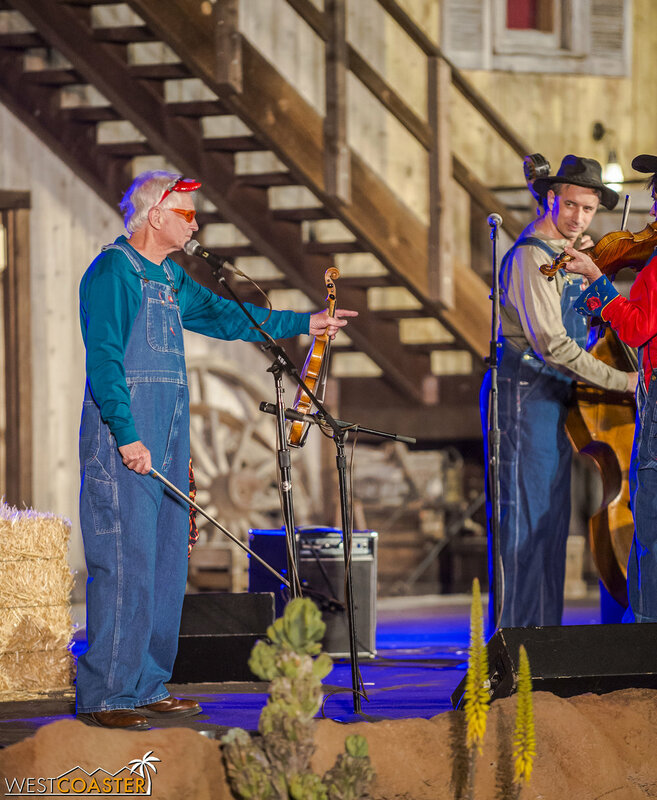 These talented musicians have imported their act from Disneyland over to Knott's and have found quite a bit of success in the three years they've been performing at the Farm. There's Kirk, himself, acting krazy. The talented band put their own spin on traditional country songs and non-country songs as well. Ever heard KISS in bluegrass form? You can with these fine folks. The quartet closes with a rousing rendition of "The Devil Went Down to Georgia." Guaranteed to get a standing ovation--if not in part because they literally demand it. The preceding was just a fraction of what's available to watch for guest enjoyment. It doesn't even include nighttime entertainment, like the Studio K Classic Dance Party or Fiesta with DJ Cruz, which provide the venue for grooving over at the Cloud 9 Ballroom and Fiesta Village, respectively. Boysenberry Ghost Town at night. And that's that for our coverage of this year's Boysenberry Festival. In just a few short years, it's gone from a fun idea to try to a legitimate and established event that people anticipate. Moving up to three weeks and four weekends is a great sign for the event, and if the Saturday crowds were any indication, this great seasonal promotion can probably support even longer. So make your way over to the Farm this month and check out all things boysenberry! I don't think you'll regret it!